This page contains a walkthrough for Mission 6 Riptide in Destiny 2, including strategy guides, obtainable weapons and armor, and enemies encountered. Mission 6 Riptide requires the Guardian to fix the two power converters at Tidal Anchor which have been infested by the hive. They will encounter fierce resistance from the Hive’s forces before reaching the objective. Follow the waypoint marker to The Rig. Be prepared to engage a group pf Acolytes and Vandals. You will be able to surprise them since they will be busy fighting. Afterwards, move forward and take out the Fallen enemies. As you approach the bridge, you will need to defeat some more Vandals as well as Dregs. Before proceeding on the bridge, shoot the Shrieker from afar. Then, prepare to engage some Acolytes and a Knight on the bridge. Note that a Captain will also spawn behind you. Be sure to use the crates as cover. Go inside the building and turn left towards the path infected by the hive to reach Tidal Anchor. As you enter Tidal Anchor, kill the Acolytes up ahead. Vandals will also appear near the pillars so take them out. Following the waypoint, you’ll come up to some Dregs and two Exploder Shanks. You can shoot the Exploder Shanks when the Dregs come close to them to kill them quickly. As you proceed further, you will encounter more Dregs and a Captain. The area has plenty of cover so use them to avoid too much damage. When the area is clear of enemies, use the terminal indicated by the waypoint to enable the wave converters. The converters will not work, however. So follow the waypoint to the red door. Once inside, be careful of the mines on the floor. As you continue to follow the waypoint, you will come to another door. There will be a Wretch and a Dreg there that you need to kill. After taking them out, follow the waypoint again but watch out for two Exploding Shanks and two Dregs as you come out of the hive-infested door. When you are in the next room, kill the twoDregs and Vandal up ahead. The next room has laser sensors that are rigged with bombs. Stand outside the door and shoot the emitter above the room to destroy the sensors. Follow the marker again and descend the pit down to the lower area. Shoot the two Shanks in the area. There will be two Dregs that will appear from cover up ahead. After you kill them, head for the room on the left marked “02”. Be careful of the motion trap and avoid it. As you continue on the path, get ready to take out a group of enemies ahead. Be careful of the Tracer Shanks shooting from other side of the path. Before you run towards the bridge, shoot the Shanks first from a distance. When you’ve cleared them out, take out the grounded enemies by using cover on the sides of the bridge. When you get to the first tower ahead, there will some more enemies, including some Cursed Thralls and a Knight. On the second bridge going to the second tower, be prepared to engage some enemies ready to ambush you. They are hiding behind the covers on each side of the bridge. There will also be more Cursed Thralls and a Knight that will come from the entrance to the second tower. 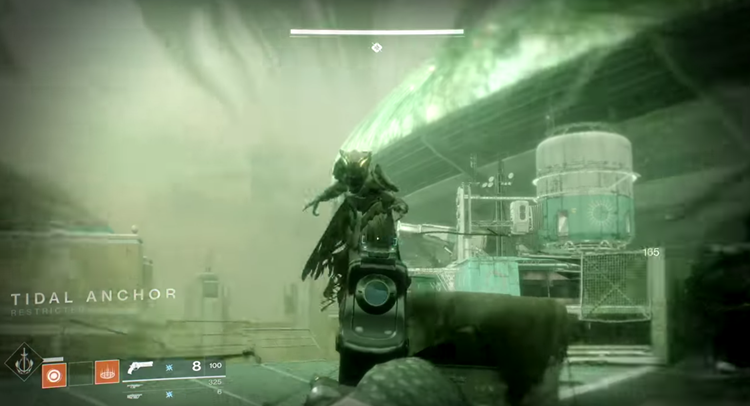 Some Acolytes will also spawn near the second tower. Following the waypoint, you will get a new objective: repair the converters. Boost yourself up to the next area and proceed inside the tower. You will reach the first converter covered infested by the hive. Shoot the infestation to get it working again. Then, exit through the hole and head for the open again. Once outside again, drop down on to the broken bridge towards the next tower. The next tower will have some Acolytes and a Knight that you need to kill. Then, head for the broken bridge and boost yourself up to the upper level. From there, turn right and boost up again. Jump over the two gaps and prepare to engage some Acolytes and a Knight. Enter the tower and go down to find the second converter infested again. Shoot it and continue making your way down and out into the open again. Once outside, jump to the broken bridge on the right. Make your way on the broken bridge up to the next area above. You will need to defeat two Hive Wizards. Quickly take out the nearest Wizard first (it will recharge its shield if you give it the chance). It is best to use a solar energy weapon. Afterwards, you can immediately focus on the second Wizard up on the platform if you managed to kill the first Wizard fast. If not, you need to clear some Acolytes and Thralls in the area first. 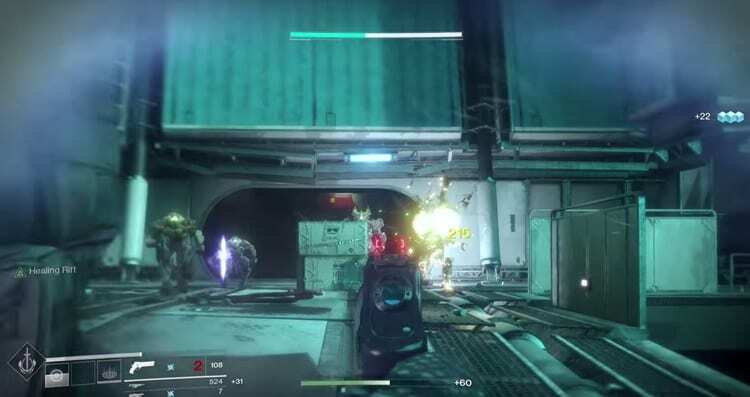 When all enemies are defeated, head up the platform indicated by the waypoint and shoot the hive infestation covering the Ciruit Breaker and use it to fix the power.